Whether it's Tuesday Night Original or Friday Night News, Wrestling With Friends is layin' it down so you don't snooze! Okay that rap was kind of atrocious, but we never said we were the Ruff Ryders...more like the Smooth Sailors! If you thought two special WWE events would have us too gobsmacked to report on the news, then you just don't know us, fella! 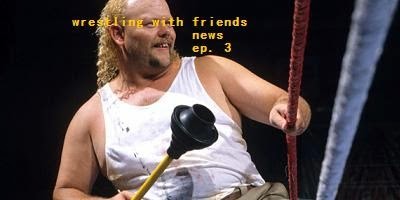 Blake, Erik and the Professor come at you with some action-packed stories from the wrestling world this week, leaving some time to get into the biggest news of it all: The Friendies! That's right, Awards Season has hit Wrestling With Friends full force, and we're kicking off the big event this week with some nomination announcements. Did your favorite person or moment make it? Well you'll just have to listen, won't you?! Talking Points: David Flair, R-Evolution, TLC...and S, WWE infighting, Randy Orton's jealousy issues, How Global is Jeff Jarrett?, Alberto El Patron's Honor, Adam Cole's owwie, a New Evolve Champ & More! Join Blake, Professor Soucek, Mr. Wrestling II & Erik, just a couple of friends chatting about wrestling. Won't you be our friend? Final Song - Ruff Ryders, "Pay Per View"